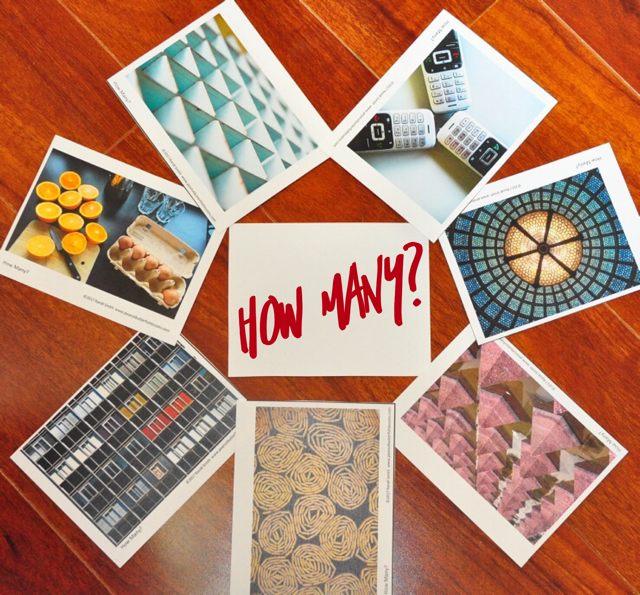 Homeschool Number Talks: How Many Do You See? 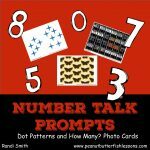 In my last post, I talked about how we were incorporating Number Talks in our homeschool this year and gave you lots of ideas about how you could start them in your homeschool, too. Today, we did a practice session with the two types of How Many? cards I created for our number talks for the first month of school. I wanted to share it with you to give you further ideas of how to incorporate number talks in your school day. 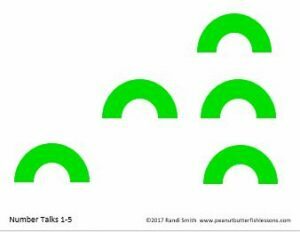 I started by telling the boys that we would be doing number talks this year to make the math part of our brain stronger. Normally, we will only do one a day, but today we would do two so that we could practice each type that I had prepared so far. I then told them the first card would be a dot pattern and that they would get to view the card for just a few seconds and then they had to tell me how many shapes they saw. The idea would be for them not to count the shapes, but for their brains to see groups of shapes to know how many there were. I told them the goal was not necessarily to have the ‘right’ answer although that is a good thing, but rather to talk about the process they used to figure out the answer. They wanted to write stuff down and I told them that rarely would we be writing during the number talks as we were really working on just using our brains to make them stronger. Big Fish raised his hand first after viewing the card for three seconds and said that there were 5 shapes because he saw 2 on the left and 3 on the right and he knew 2 +3 =5. Yes! That is about the most perfect answer you could say and I swear I did not prep him for it! Little Fish then said he saw 2 and 2 and 1 and then his brain just knew that was 5. I had him show me on the card where he saw each of those groups and he did this. 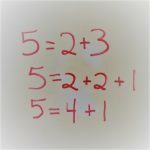 Then, one of them went on to say that you could say the one on the left is by itself and then the 4 on the right are together and 4 + 1 =5. I wrote all of their responses on the board AFTER they were done explaining themselves. So next I pulled out this card and asked them how many they saw. I told them that they could interpret that question however they wanted. Well, the wonderful feeling I had about how quickly they caught onto the idea with the dot pattern was quickly swept away! Ha! They really got stuck on wanting to count how many total objects were in the picture. So we discussed this and then wrote it down and then I prompted them a few times about what else could we count in the picture. They really weren’t taking my hint, though. Finally, Big Fish did say there were 3 groups of objects, one being the oranges, another the eggs, and a third group being the glasses etc. Ok, maybe we were getting somewhere. But….no. 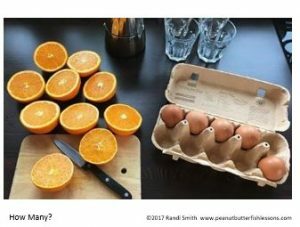 So finally I just asked outright, “What if we just counted the oranges? So then Big Fish told me there were 10 orange slices. Ok, good. “But are they really slices?” “They are orange circles.” “hmmm….”. Finally, Little Fish piped up that they are halves of oranges. Yes! Ok, so then how many whole oranges do we see? 5! Yes! 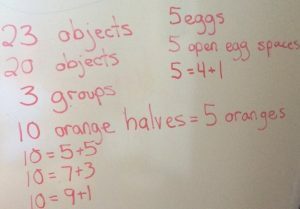 Then, Big Fish decided he was going to start naming all the different ways to make 10 with the oranges so we went with that for awhile and maybe I should have let him go through all the ways, but Little Fish, our tactile learner, was checking out. So I prompted them to look at the eggs. They then told me there were 5 eggs and then realized there were 5 empty spaces and that you could see they were arranged 4 in one row (I had to give them the word “row” to help them explain) and 1 in the other row. Finally, Little Fish asked if we could be done so I obliged and stated that this is why we will normally do only one card during morning meetings! Again, I had written everything down after they finished explaining themselves. But, then the best part may have been that Big Fish came into Little Fish’s closet classroom a little while later to see what he was doing in math and then started playing with the math balance saying how it was the coolest thing. He now wants to switch from doing Teaching Textbooks on the computer for math to the same math as his brother (RightStart Math). Umm…no, child, we already invested $100+ in your math for this year. We can make a change for 5th grade! But, I do love that all of sudden he was wanting to play around with numbers and try different things! If you want to purchase the Dot Pattern and How Many? Prompt Cards, click here. If you want to try a sample before you buy, click here.